My favourite bit of school art and design was putting together a moodboard in the brainstorming stages of a piece. I loved collecting material and cutting out bits from magazines and writing all my little notes on them. There was something so satisfying about seeing all your thoughts and ideas arranged on a piece of paper and doing it digitally is (almost) as good! I've never been particularly into pink but as I'm growing up I'm becoming more and more drawn to the colour. There's something so bright and happy about it and in moderation I think pink can really lift a room or an outfit. So today's moodboard is all about my new found love for pops of pink! I've been dying on getting a baby pink coat for Spring/Summer for a while. 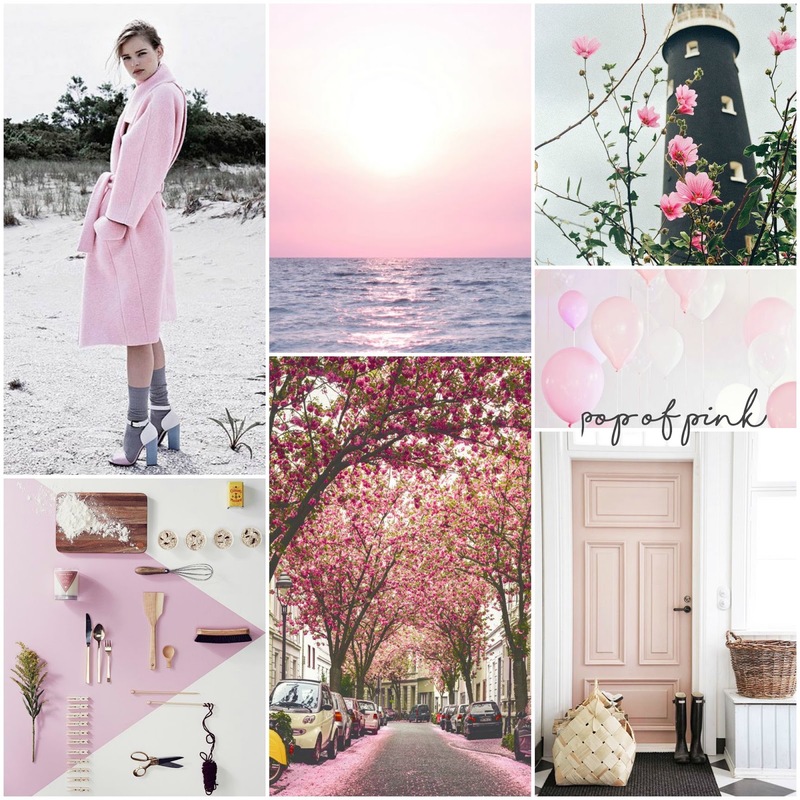 I wear mostly black, white and grey so I think pink will be a great way to introduce a bit of summery colour to my wardrobe! I also can never resist taking millions and millions of photos when I'm on holiday of blossoms and bourgainvilla flowers. Also if you follow me on Instagram you will see I can't resist a snap of a pink and white two-tone tulip - they're my favourite! Finally, as you'll have seen me talk about before I'm so excited to hopefully have a flat of my own next year and my whole home interiors board on Pinterest is getting rammed full of minimal but cosy rooms with little pops of pink, dove grey and mint accessories. Sigh... I really should stop taunting myself.